Introduction: Pituitary insufficiency (PI) needs further research to optimize treatment. Growth hormone deficiency (GHD) is a subtype of PI. The purpose of the present study is to investigate the possible relationship between GHD and the anatomical position of the pons as revealed by magnetic resonance imaging (MRI) in the pediatric age group. In the current study, we developed a novel and simple index using MRI that could provide an alternative to other indexes in the classical literature. Patients and Methods: Brain MRI and clinical data of 48 children with suspected PI (22 females, 26 males; mean age 11.6 ± 2.2 years) were examined retrospectively. To estimate the location of the pons, the ratio of pons height over the axis between the dorsum sellae and the fourth ventricular hill in the sagittal plane (A) to the total height of the pons (B) was calculated (A/B). It was termed the pons ratio (PR). The PRs of children with or without a diagnosis of GHD were then compared statistically. Results: Fifteen children were diagnosed with GHD and treated with growth hormone (GH), whereas the remaining 33 were reported normal. The mean PRs of the children diagnosed with GHD and given GH treatment (0.31 ± 0.07, range: 0.18–0.42) differed significantly from those without PI (0.26 ± 0.06, range: 0.17–0.44; P = 0.018). Conclusion: There appears to be an association between GHD and decreased PR in children receiving GH treatment. Spatial measurements of posterior fossa in radiological examinations may provide additional information that is helpful in the diagnosis of suspected cases of GHD. Key Message: Pons ratio may be used as a diagnostic biomarker of the possible relationship between growth hormone deficiency and posterior fossa development in children. The pituitary gland is a small organ of vital importance and any abnormality in hormone levels indicates pituitary insufficiency (PI), a serious clinical and radiological problem. Magnetic resonance imaging (MRI) is useful for revealing the anatomy of the pituitary region. However, children with growth hormone deficiency (GHD) mostly have normal MRI. Tsai et al., found that 67% of their patients with isolated GHD had a normal MRI, similar to former studies where normal pituitary anatomy was seen in 20–70% of the patients on MRI. On the other hand, growth hormone (GH) replacement therapy affects anthropometric measurements (head circumference, fronto-occipital head diameter, etc.). In particular, skull measurements related to developmental defects of the posterior fossa (PF) could be a clue to the diagnosis of GHD. Indeed, Fujita et al., found that the smaller PF volume is more often associated with patients with Chiari malformation More Details (CM) and various endocrinological disturbances such as GHD than in normal individuals. On the basis of their morphometric study, Nishikawa et al., suggested that the tentorium becomes steeper in patients with CM and the neural tissue herniates into the spinal canal by compensating for the reduced dimension of the bony PF. On the skull floor, the inter-sphenoid synchondrosis closes at the birth and the spheno-ethmoidal synchondrosis fuses at 7 years, but the synchondrosis of the sphenoid and occipital bone is closed at the end of puberty. This anatomical knowledge is vital for understanding the developmental abnormalities in the posterior cranial fossa in children with GHD. On the basis of our preliminary observations, we speculate that the pituitary stalk is stretched and the hypothalamo-hypophyseal system is displaced in patients with GHD, possibly because of the upward movement of the brain stem resulting from developmental defects in the bony structure of the PF. To test this hypothesis, we examined the location of the pons as detected by MRI in pediatric patients with PI. To the best of our knowledge, this is the first study investigating the location of the pons in patients with GHD. The brain MRI findings and clinical data of 48 children with suspected PI (22 females, 26 males; mean age 11.6 ± 2.2 years, with a range 6–14 years) were examined retrospectively by two radiologists blinded to the clinical information concerning the cases. Fifteen of the 48 children were followed up in the pediatric endocrinology polyclinic with a diagnosis of GHD and were receiving GH treatment, whereas 33 children without GHD were used as the control group. In this study, GHD was diagnosed when the GH peak was <10 ng/ml in the clonidine and L-dopa tests. Panhypopituitarism was also evaluated by measuring the other hypophyseal hormones (adrenocorticotrophic hormone [ACTH], cortisol, follicle stimulating hormone [FSH], luteinizing hormone [LH], thyroid stimulating hormone [TSH], and prolactin [PRL]). Based on these measurements, 13 of the 15 children were determined to have isolated GHD and the rest had panhypopituitarism. The MRI findings were normal for the hypophysis, and no apparent PF malformation other than our findings was detected. GH treatment had also no effect on the hypophyseal volume and dimensions. Any brain/suprasellar mass, arachnoid cyst, an interrupted or thin pituitary stalk, an absent or ectopic posterior pituitary gland, anterior pituitary hypoplasia or aplasia and hindbrain malformation were excluded from the study. This study was approved by the Local University Ethical Committee (No. 2016/880). The MRI examinations were performed using a 1.5-Tesla Philips Achieva (field of view 231 × 220, Philips Healthcare, the Netherlands) at our institute in the period from 2013–2016. On sagittal T2-weighted images (TR: TE 5840:110, FA 90, matrix size 244 × 194), an axis was drawn from the dorsum sellae to the posterior angle of fourth ventricle (primary axis printarticle.asp?issn=0028-3886;year=2018;volume=66;issue=6;spage=1680;epage=1684;aulast=Tuncyurek) [Figure 1]. The Klaus index (KI) was calculated. Twining's (TW) line, binding the tuberculum sellae (TS) and internal occipital protuberance, was drawn. The KI is the shortest interval from the peak of the dens to the TW [Figure 2]b. The PR, an indicator of the location of the pons relative to the PF, was used to assess the developmental and morphological defects in the PF-pons. The PRs of children with and without diagnoses of GHD were compared to assess the diagnostic value of the PR; that is, the location of the pons on the sagittal axis. The Statistical Package for the Social Sciences [SPSS] version 14.0 (Chicago, IL, USA) was used for assessment. The data were summarized using descriptive statistics such as the mean, standard deviation, and range. The PRs of children with and without the diagnoses of GHD were compared using the independent sample t-test. A receiver operating characteristic (ROC) curve was used to determine the optimum cut-off PR value for the diagnosis of GHD. A P-value < 0.05 was considered to indicate statistical significance. Of the 48 children examined, 15 (10 males, 5 females; mean age 11.0 ± 2.7 years; height 133.5 ± 13.2 cm; and weight 28.5 ± 18.3 kg) were undergoing GH replacement treatment for GHD, whereas the remaining 33 control children without GHD (16 males, 17 females, mean age 12.0 ± 1.8 years; height 155.2 ± 16.4 cm; and weight 47.9 ± 20.3 kg) had normal brain MRI findings and no pathological diagnosis of any disease [Table 1]. It was obvious that both the measurements of height and weight of children without GHD were higher than those of the control children with GHD (P = 0.06 and P = 0.01, respectively). [Figure 3] shows the MRIs of the PRs of children with and without GHD. The PR was significantly higher in children with GHD (mean 0.31 ± 0.07, range 0.18–0.42, median 0.34 mm) than those without GHD (mean 0.26 ± 0.06, range 0.17–0.44, median 0.25 mm; P = 0.018). 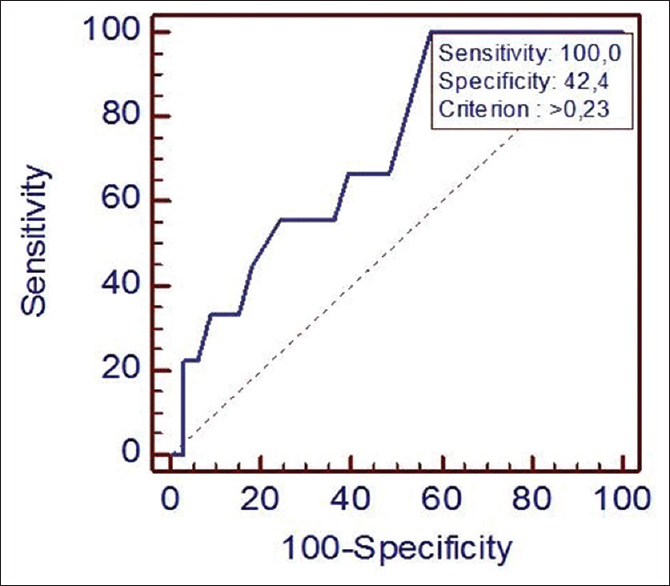 In the receiver operating characteristic (ROC) curve analysis, a cutoff PR value of 0.235 for diagnosing GHD had an 100% sensitivity and 42.4% specificity [Figure 4]. The CCA differed significantly between the children with and without GHD (137.0 ± 7.1 and 144.8 ± 7.6, respectively, P = 0.005). The KI also differed significantly between the children with and without GHD (35.6 ± 4.5 and 40.0 ± 4.1, respectively, P = 0.004). A box-and-whisker plot showing the PR, CCA, and KI in children with and without GHD is presented in [Figure 5]. Importantly, the PR in children with GHD was higher than those without GHD (P = 0.01). 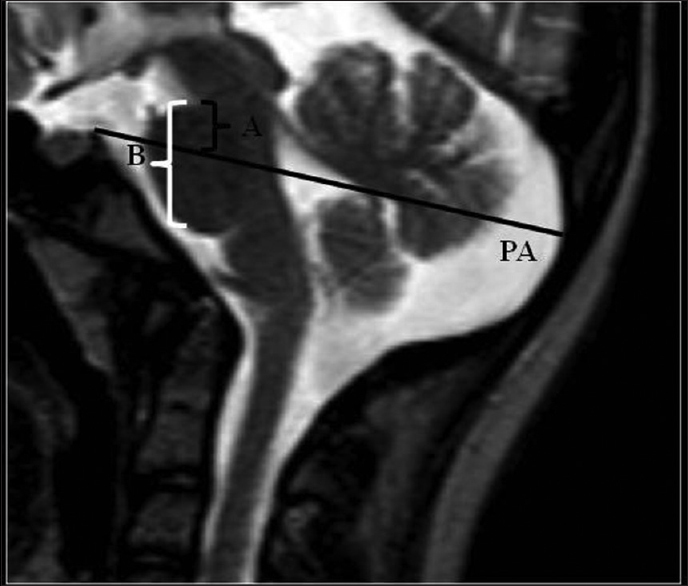 This retrospective case-control study examined the PF and pons on MRI, focusing on the location of the pons in relation to the PF on the sagittal axis, and its association with GHD. On the basis of our findings, we suggest that the newly described PR is a novel index for differentiating between GHD and normal cases. Recently, Ertekin et al., calculated the pituitary volume in a stereological study using MRI. Today, MRI is the standard method for assessing pituitary development and abnormalities in children.,, Nevertheless, most children with GHD have normal MRI. Therefore, it is necessary to define a hidden structural abnormality specific for patients with GHD for an early and definitive diagnosis of PI. Here, we have shown that the location of the pons is abnormal with respect to PF structures in patients with GHD, and we suggest that radiological evaluation of the suspected cases should include spatial measurements from the PF for establishing the correct diagnosis. The evaluation of the pituitary gland is based primarily on the radiologist's experience. The PR was defined recently. 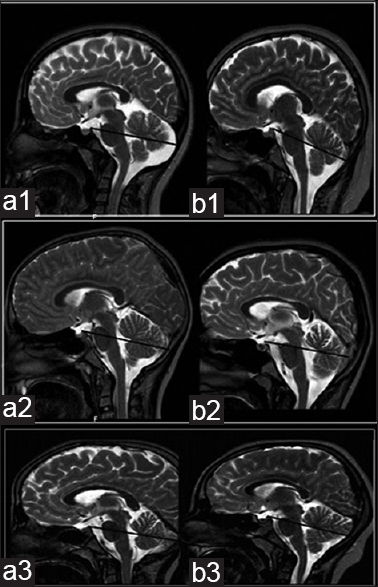 Beukhof et al., described the classical MRI triad in pituitary stalk interruption syndrome that consists of: (1) an interrupted or thin pituitary stalk; (2) an absent or ectopic posterior pituitary gland; and, (3) anterior pituitary hypoplasia or aplasia. These MRI findings are frequently found in idiopathic GHD, which are related to pituitary abnormalities. However, we did not detect these MRI findings in our patient group. In previously reported patients with CM, a mesodermal malformation, the small PF associated with occipital dysplasia was identified upon morphometric analyses.,,, The brain stem moves downwards in CM, but upward displacement of the pons relative to PF owing to its small size may cause stretching of stalk of the pituitary gland, or it could be just a sign of underdeveloped bone tissue as a result of PI. The pituitary stalk may move vertically between the pituitary gland and hypothalamus, leading to displacement of the hypothalamo-hypophyseal system. Unfortunately, it is difficult to recognize this finding on routine brain MRI scan protocols. In the current study, we used brain stem locations from the MRI study, whereas all PF measurements in the previous studies had been calculated by certain bone references. In the present study, we have specifically measured the KI and our findings are quite similar to those of Karagöz et al. According to their study, the clivus length and KI were noticeably shorter in patients with CM than in normal subjects. The results of previous studies have clearly revealed that the basiocciput growth is delayed in CM.,, Accordingly, the KI and CCA differed significantly between the patients with and without GHD in our cases. These morphometric findings strongly suggest that the PF is smaller than normal in GHD. The CCA measurements from plain radiographs range from 150° to 180° and values lower than 150° are accepted as pathological. Nevertheless, the normal values were different in MRI studies. Botelho et al., calculated that the range of CCA was 129–179°. In our study, all patients had an angle that was less than 150°. Technically, the occipital protuberance and the tip of dens are hardly defined in X-ray images. In the current study, we developed a novel and simple index using MRI that could provide an alternative to other indices in the classical literature. According to Nishikawa et al., the tentorium is pushed forwards and becomes perpendicular; and, by compensating for the reduced volume of PF, the neural structures herniate upwards or downwards. It is interesting to note that the brain stem herniated upwards in our cases with GHD. Embryologically, the notochord and the paraxial mesoderm extend cranially into the region where the brain develops, and the pituitary gland arises from the diencephalon. Some mutations can cause human pituitary diseases, including isolated or combined hormonal abnormalities, and many specific syndromes such as septo-optic dysplasia, hypopituitarism and mental retardation, holoprosencephaly, and multiple midline defects may also occur. It has been speculated that the simple morphological stretching of the stalk of the PF during the development leads to hypothalamo-PI. GHD might inhibit the development of the posterior calvarium by preventing bone growth, whereas the developmental defects of the paraxial mesoderm affect occipital development. As a result, these anomalies can develop concurrently with underdevelopment of the pituitary gland. In clinical practice, the gland is commonly assessed on the basis of radiological evaluation. The PR was initially defined on MRI in our study, though some measurements were defined on the X-ray images. This ratio of A to B was higher in GHD patients, which indicates that the height of the pons above the PA is greater. The high value of the ratio of A to B in the GHD group does not indicate a specific malformation. In our study, we think that we discovered an important relationship between the PF changes and GHD. On the other hand, this study had several limitations. First, the number of patients recruited was less and the study was retrospective in nature, both of which prevented the attainment of a definitive conclusion regarding the diagnostic value of pontine location in the pediatric population with GHD. We need to enlarge the number of the patients and we should also examine more patients with PI. Second, because of the administration of GH replacement therapy in the recruited patients, no correlation between the hormonal levels and MRI measurements could be established, which would have demonstrated the correlation between the pontine location and GHD. However, this is the first study that assesses the pons in GHD; our data suggest the diagnostic value of assessing the location of pons in suspected cases. It will certainly be very interesting to find out whether or not the PR is valid for establishing a definitive diagnosis of GHD in children. As our finding showed a low specificity, additional prospective clinical studies with large sample sizes are needed for drawing a definitive conclusion regarding the value of the pontine location, estimated using the PR on MRI, for diagnosing GHD in the pediatric population. Finally, this research was designed for a selected group with certain exclusion criteria; further studies are necessary in the future to establish the reproducibility of these findings. In conclusion, the PR is a novel and simple index for predicting GHD. Our findings indicate that GHD is associated with a higher PR on MRI, indicating a higher location of the pons on the sagittal axis. Therefore, we suggest that the radiological examination of the suspected cases of GHD should include spatial measurements from the PF to establish the correct diagnosis in clinical practice. We thank Ms. Suzan Stokes for her valuable support in revising the manuscript. Tsai SL, Laffan E, Lawrence S. A retrospective review of pituitary MRI findings in children on growth hormone therapy. Pediatr Radiol 2012;42:799-804. Sorgo W, Zachmann M, Tassinari D, Fernandez F, Prader A. Longitudinal anthropometric measurements in patients with growth hormone deficiency. Effect of human growth hormone treatment. Eur J Pediatr 1982;138:38-45. Fujita K, Matsuo N, Mori O, Koda N, Mukai E, Okabe Y, et al. The association of hypopituitarism with small pituitary, invisible pituitary stalk, type 1 Arnold-Chiari malformation, and syringomyelia in seven patients born in breech position: A further proof of birth injury theory on the pathogenesis of “idiopathic hypopituitarism”. Eur J Pediatr 1992;151:266-70. Nishikawa M, Sakamoto H, Hakuba A, Nakanishi N, Inoue Y. Pathogenesis of Chiari malformation: A morphometric study of the posterior cranial fossa. J Neurosurg 1997;86:40-7. Ohtsuki F, Mukherjee D, Lewis AB, Roche AF. A factor analysis of cranial base and vault dimensions in children. Am J Phys Anthropol 1982;58:271-9. Ertekin T, Acer N, Turgut AT, Aycan K, Ozcelik O, Turgut M. Comparison of three methods for the estimation of the pituitary gland volume using magnetic resonance imaging: A stereological study. Pituitary 2011;14:31-8. Di Iorgi N, Allegri AE, Napoli F, Bertelli E, Olivieri I, Rossi A, et al. The use of neuroimaging for assessing disorders of pituitary development. Clin Endocrinol 2012;76:161-76. Naderi F, Eslami SR, Mirak SA, Khak M, Amiri J, Beyrami B, et al. Effect of growth hormone deficiency on brain MRI findings among children with growth restrictions. J Pediatr Endocrinol Metab 2015;28:117-23. Wang Q, Hu Y, Li G, Sun X. Pituitary stalk interruption syndrome in 59 children: The value of MRI in assessment of pituitary functions. Eur J Pediatr 2014;173:589-95. Beukhof CM, Lequin MH, Drop SLS. The classic triad and variants. MRI in congenital hypopituitarism: A reference guide. Remedica Medical Education and Publishing, London and Chicago; 2007. p. 69-80. Maghnie M, Triulzi F, Larizza D, Preti P, Priora C, Scotti G, et al. Hypothalamic-pituitary dysfunction in growth hormone-deficient patients with pituitary abnormalities. J Clin Endocrinol Metab 1991;73:79-83. Badie B, Mendoza D, Batzdorf U. Posterior fossa volume and response to suboccipital decompression in patients with Chiari I malformation. Neurosurgery 1995;37:214-8. Milhorat TH, Chou MW, Trinidad EM, Kula RW, Mandell M, Wolpert C, et al. Chiari I malformation redefined: Clinical and radiographic findings for 364 symptomatic patients. Neurosurgery 1999;44:1005-17. Atkinson JL, Kokmen E, Miller GM. Evidence of posterior fossa hypoplasia in the familial variant of adult Chiari I malformation: Case report. Neurosurgery 1998;42:401-3. Smoker WR. Craniovertebral junction: Normal anatomy, craniometry, and congenital anomalies. Radiographics 1994;14:255-77. Karagoz F, Izgi N, Kapijcijoglu Sencer S. Morphometric measurements of the cranium in patients with Chiari type I malformation and comparison with the normal population. Acta Neurochir 2002;144:165-71. Batista UC, Joaquim AF, Fernandes YB, Mathias RN, Ghizoni E, Tedeschi H. Computed tomography evaluation of the normal craniocervical junction craniometry in 100 asymptomatic patients. Neurosurg Focus 2015;38:E5. Tubbs RS, Wellons JC 3rd, Smyth MD, Bartolucci AA, Blount JP, Oakes WJ, et al. Children with growth hormone deficiency and Chiari I malformation: A morphometric analysis of the posterior cranial fossa. Pediatr Neurosurg 2003;38:324-8. Pirinen S, Majurin A, Lenko HL, Koski K. Craniofacial features in patients with deficient and excessive growth hormone. J Craniofac Genet Dev Biol 1994;14:144-52. Botelho RV, Ferreira ED. Angular craniometry in craniocervical junction malformation. Neurosurg Rev 2013;36:603-10. Mehta A, Dattani MT. Developmental disorders of the hypothalamus and pituitary gland associated with congenital hypopituitarism. Best Pract Res Clin Endocrinol Metab 2008;22:191-206. Schady W, Metcalfe RA, Butler P. The incidence of craniocervical bony anomalies in the adult Chiari malformation. J Neurol Sci 1987;82:193-203.